Roland Franssen and Javier Eguiluz in #20697 and #20722. 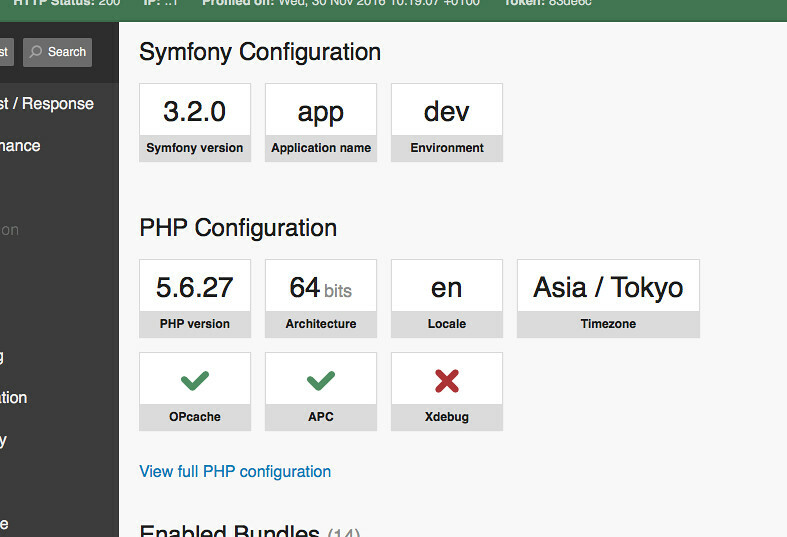 In the Symfony Profiler, the Configuration panel shows the value of some of the most important PHP and Symfony configuration options. This panel is specially useful for Symfony newcomers, because it helps them spot problems like not having enabled a PHP accelerator or having enabled a wrong set of bundles. However, this panel lacked some important information. For example, we get a lot of issue reports caused by using a 32-bit PHP architecture instead of 64-bit. That's why in Symfony 3.3, this panel will include more information. Amazing information - would be great if there was a pop up box with that information formatted ready to be copy-and-paste'd into new issues. Would save so much time trying to figure out how to recreate bug conditions! Nice job! This should increase adoption of LTS and/or newer versions! Displaying the information about the Symfony version looks like a good idea to me. Sometimes I need this information and I must look for it in the web. That's great placement of this information! What about making the same thing for PHP? I think not so many people know about PHP 5.6 active support ending in the end of 2016. @Tomáš there's a big issue that prevents displaying that information for PHP. In the case of Symfony, the information is built-in as constants in the Kernel class itself. Besides, this information is reliable because Symfony always complies with its promises. However, PHP doesn't provide this information in its own code. So we should make a HTTP request to get that information somewhere ... and I'm afraid that's a no-go for the web profiler. @Javier Eguiluz: I see. I assumed there is some json services that does that for Symfony versions. And that same could be done for PHP. Great features! I love those new small things that make it more obvious what you're dealing with.